Our new Online Bill Pay System is here. Introducing It’s Me 247 Bill Pay! 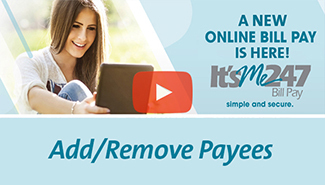 Pay your bills from the comfort of your own home, office, or anywhere else you have internet access. It’s Me 247 Bill Pay makes your life easier. No checks to sign. No stamps to buy. No envelopes to seal. Pay your bills anytime day or night. Want to learn more about how to use It’s Me 247 Bill Pay? Check out the videos below for some of your next steps!